Very calm seas were ideal for looking for divers around the coast. At least 19 Great Northern Divers were present, and soon enough a smart White-billed Diver in full summer plumage was found sitting in the sea off Tor Ness. Multiple records have occurred here in the past, and it wasn't long before another, also an adult in summer plumage, was located a bit further up the coastline. 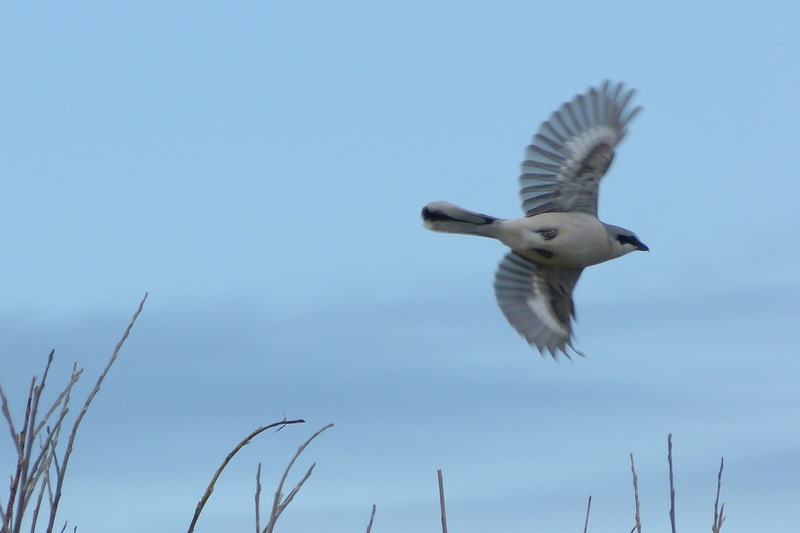 The first 2 Great Grey Shrikes of the year also arrived: 1 was discovered near Ancum Loch, and another was near Rue at the same time. Besides these scarcities, only a small number of new birds were seen, the best of which were a Whimbrel, a Collared Dove and a Long-eared Owl. A couple of Swallows, a Ring Ouzel, 2 Goldcrests and a Siskin were seen, the Scaup was still on Gretchen Loch and the flock of Knots at Tor Ness increased to 12 birds. White-billed Diver. An early contender for worst blog photo of the year. There was little new to report during a glorious day of windless bright sunshine. A Kestrel and a couple of Sparrowhawks were seen, 8 Swallows and a Woodpigeon arrived and counts of small migrants included 2 Ring Ouzels, 1 Willow Warbler, 6 Chiffchaffs, 1 Blackcap, 3 Bramblings, 1 Chaffinch and 1 Lapland Bunting. 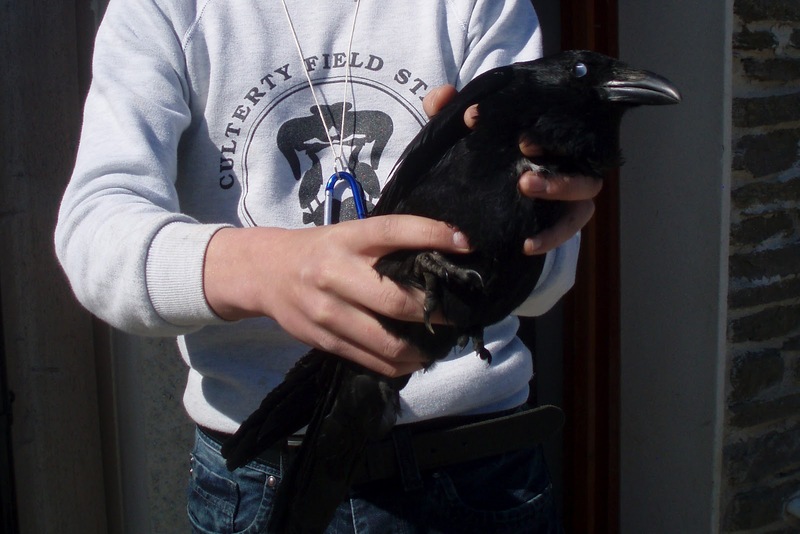 The day's ringing highlight was this Carrion Crow caught in the observatory crow trap. The trap has been very successful for catching gulls and Starlings, but migrant corvids are usually a bit too wily and astute to allow themselves to be trapped and this is only the second Carrion Crow ever ringed on the island. A Wryneck and a Hawfinch were the highlights from a perfectly calm day of sunshine. 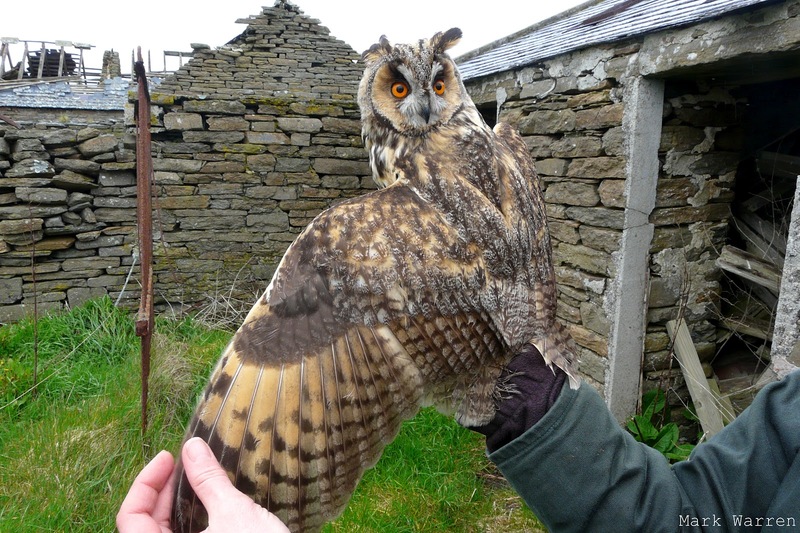 Other migrants included a Long-eared Owl, 8 Ring Ouzels, 2 Swallows, 2 Siskins, a Tree Pipit, a Woodcock and 10 Knots. The Scaup and a Common Scoter were still present, and 8 of the Lapland Buntings were seen again at Kirbest. Fairly quiet despite dropping wind, the day produced little change in the island's birds. 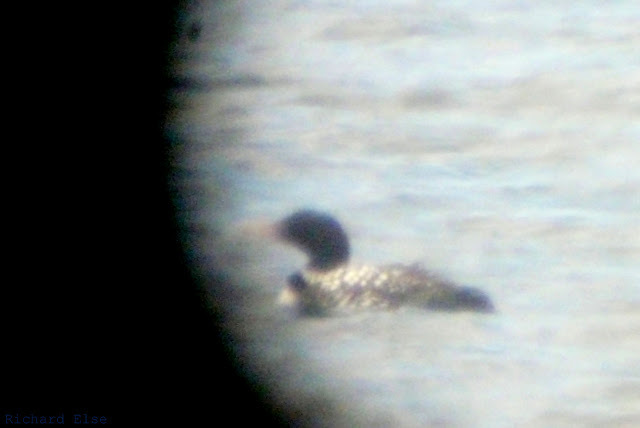 A female Scaup on Gretchen Loch and 2 Grey Plovers on the golf course were the highlights. Numbers of common migrants were still similar to the previous few days, and included 2 Sparrowhawks, 1 Swallow and the flock of 10 Lapland Buntings. There were clearly a few new migrants to be found during a cold and windy day. 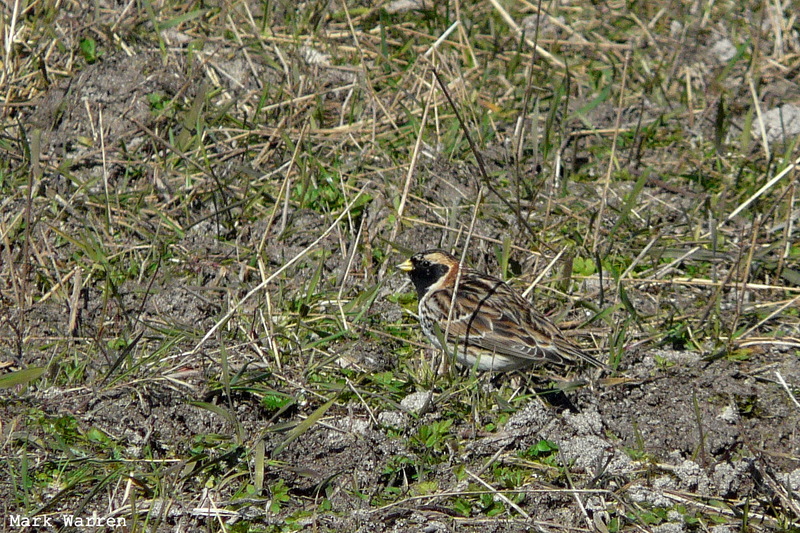 The highlights were 10 Lapland Buntings in the stubble field at Kirbest and 3 Long-eared Owls. Other migrants were still present in quite good numbers: 5 Ring Ouzels, 66 Robins, 16 Dunnocks, 3 Swallows, 11 Song Thrushes, 23 Chiffchaffs, 2 Willow Warblers, 2 Blackcaps and 6 Bramblings were seen on the day's census routes. Things seemed to be grinding slowly to a halt for a couple of days. There were still migrants around in good numbers, but little seemed to be arriving to replace those birds that departed overnight. 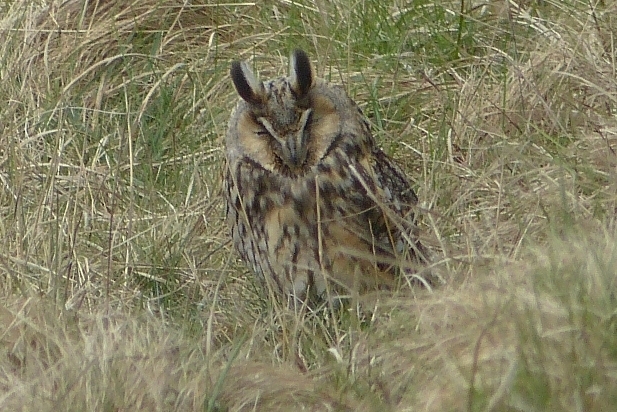 New birds on the 24th included a Short-eared Owl, a Woodcock and a Peregrine, while 16 Dunnocks and 13 Chiffchaffs were seen and Robins remained in triple figures. 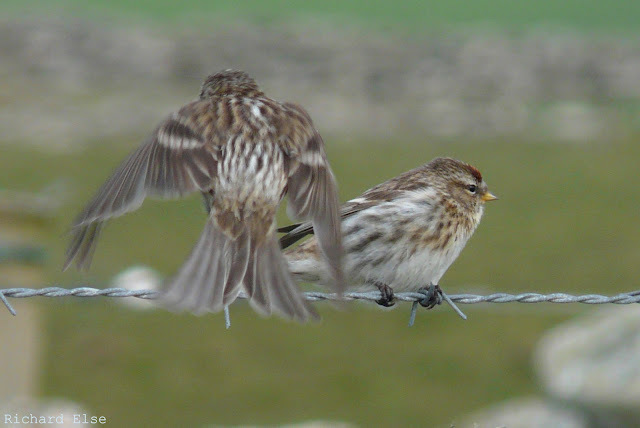 A Swallow and a Lapland Bunting were the highlights of a very blustery 25th. A flock of up to 18 Bramblings was in the crop field outside the observatory on both days, and most of them were caught and ringed. Numbers of migrants fell noticeably, clear skies providing the green light for many to move on during the night. That said, there were still enough birds for another enjoyable day of census work, including counts of 75 Robins and 29 Dunnocks. The most unusual bird of the day was a female Garganey at Hooking Loch, while a Knot, a Jacksnipe and a Whimbrel were notable waders. A Long-eared Owl and a Short-eared Owl, 3 Sparrowhawks and a Collared Dove were seen, and the 3 Common Scoters were still present. Counts of small migrants included 21 Bramblings, 1 Goldcrest, 1 Willow Warbler, 29 Chiffchaffs, 2 Blackcaps, 32 Song Thrushes, 7 Fieldfares, 1 Ring Ouzel, 4 White Wagtails, 2 Tree Pipits and 3 Swallows. For the last few days we have enjoyed one of the biggest spring falls of Robins the observatory has ever recorded. Today's Knot was the first for a few weeks. The deluge of migrants still showed no sign of abating, although what proportion of the Robins and other birds on the island were freshly arrived, and what proportion were simply remaining from the previous couple of days was impossible to determine. The day's Robin count reached 234, and 45 Dunnocks broke the species' all-time record again. Numbers of some other small migrants came to 47 Chiffchaffs, 11 Willow Warblers, 4 Blackcaps, 53 Song Thrushes, 4 Ring Ouzels, 76 Wheatears and 3 Lapland Buntings. A real crow bonanza comprised 3 Jackdaws (the first of the year), 25 Rooks, 13 Carrion Crows, 23 Hooded Crows, 1 Hooded x Carrion Crow hybrid and a migrant Raven, mostly flying back and forth in typically indecisive corvid manner. Other passerine odds and ends from the day's census included a Swallow, 2 Tree Pipits, 2 White Wagtails, the same Whitethroat, a Goldcrest, 4 Chaffinches, 14 Bramblings, and a Common Redpoll. A Common Buzzard was the highlight of a good raptor day that also brought a Kestrel, a Peregrine and at least 8 Sparrowhawks, as well as another new Long-eared Owl and a Short-eared Owl. A Wryneck on the west coast was presumably fresh-in. The first 2 Barnacle Geese of the year and 3 Pink-footed Geese flew by, 87 Curlews passed north overhead and the 3 Common Scoters still remained. Finally, a whole-island count of Black Guillemots found 565 around the coast, which is just 3 birds fewer than were seen in the 2011 survey. 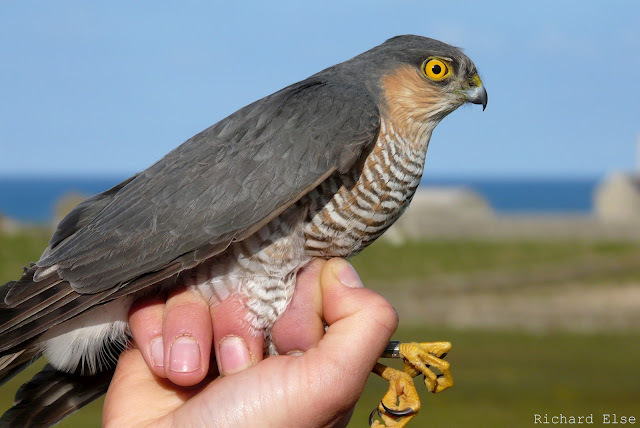 A remarkable evening ringing session resulted in no fewer than 6 new Sparrowhawks being caught in the mist nets. Common Buzzard is a scarce migrant on North Ronaldsay, and today's bird was the first for more than a year. Another mass overnight arrival of migrants gave a further increase in the number of birds on the island and made for another exciting and busy day. Robins and Dunnocks were everywhere. A count of 149 Robins was the highest spring total since 1993, and 40 Dunnocks was a new all-time record - and we only managed to cover about half of the island. The actual numbers present must have been considerably higher. Thrushes were again very numerous, including 49 Song Thrushes and a bare minimum of 16 Ring Ouzels, while counts of warblers came to 39 Chiffchaffs, 8 Blackcaps, 3 Willow Warblers and our earliest ever Whitethroat by 3 days. The list of other small migrants included 2 Swallows, 3 Tree Pipits, 1 White Wagtail, 46 Wheatears, 10 Bramblings, 4 Chaffinches, 2 Siskins, 1 Common Redpoll and 4 Carrion Crows. The first Whimbrel of the year flew overhead, and the only other noteworthy non-passerines were 2 Long-eared Owls, 2 Sparrowhawks, a Kestrel and the 3 Common Scoters still in Linklet Bay. Both Long-eared Owls were ringed during a busy morning of mist-netting at Holland House. 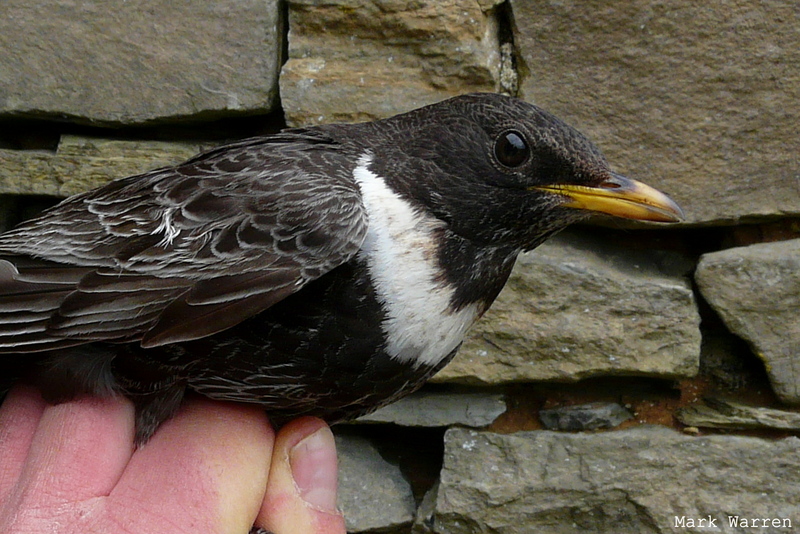 The actual number of Ring Ouzels seen could easily have been much higher, but they were very mobile. We couldn't be certain whether or not a flock of 11 seen in the afternoon included birds from the various small groups seen in the morning. Lots more birds made for another fantastic and exhausting day's birding, with several uncommon species appearing. 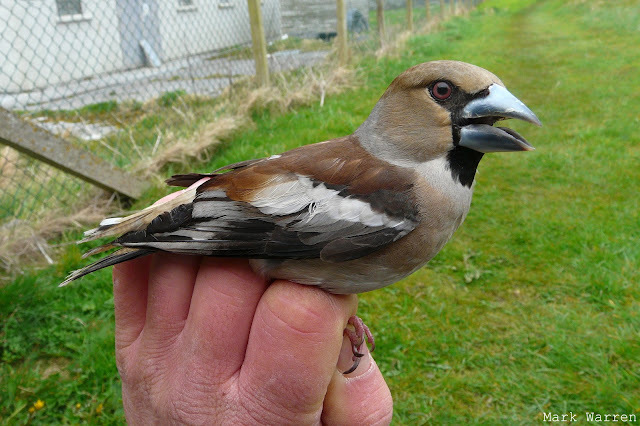 Things got off to a great start with a Hawfinch ringed at Holland House garden early in the morning. A Wryneck at Cruesbreck was followed by another at Sangar, a Stonechat and a Green Sandpiper were at the north of the island, and a Mistle Thrush and a flava Wagtail were also both new species for the year. Numbers of common migrants increased again, with 109 Robins, 41 Song Thrushes and 32 Chiffchaffs scattered around. At least 11 Ring Ouzels were seen, as well as 10 Dunnocks, 9 Blackcaps, 8 Willow Warblers, 6 Reed Buntings, 3 White Wagtails and 2 Swallows. 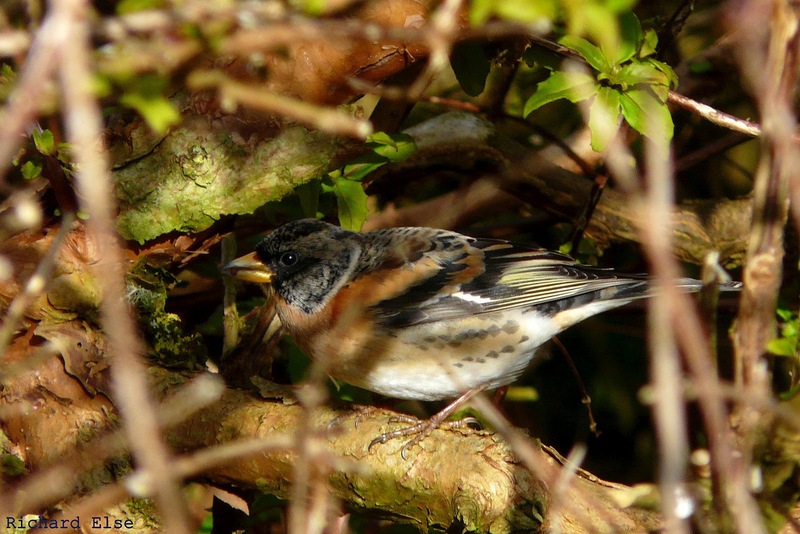 Migrant finches included 9 Bramblings, 3 Chaffinches and 3 Common Redpolls. 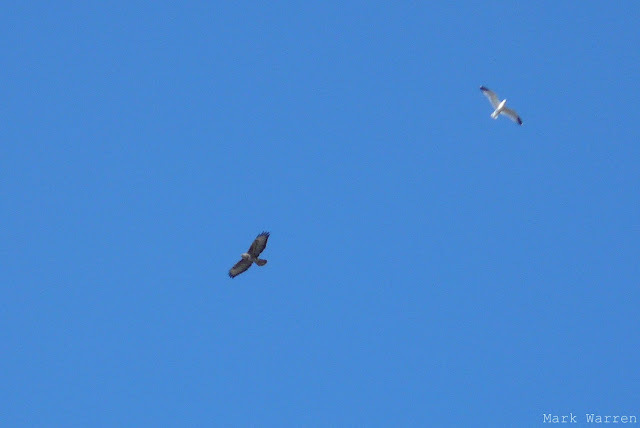 The 3 Common Scoters remained, 2 Sparrowhawks and a Kestrel arrived and Golden Plovers increased to 428. With migrants arriving all day, plenty of birds must have gone unfound; but thrushes and other passerines were scattered all over the island by evening. Counts of some of the most numerous species came to 49 Blackbirds, 35 Song Thrushes, 59 Wheatears, 41 Robins, 15 Chiffchaffs and 9 Willow Warblers. A wide range of other passerines included the first 5 Ring Ouzels of the year, 2 Swallows, 1 White Wagtail, 1 Dunnock, 6 Fieldfares, 13 Redwings, 2 Blackcaps, 2 Goldcrests, 4 Carrion Crows, 2 Chaffinches, 7 Bramblings, 1 Siskin, and 4 Common Redpolls. Despite passerines dominating the day's birding, the scarcest sighting of the day was 2 Black-throated Divers in Linklet Bay. Although a very uncommon bird here, this is already the third record of 2012. A Long-eared Owl, a Sparrowhawk, 3 Grey Herons and 3 Common Scoters were among other non-passerines, and a long-staying Iceland Gull was still around. 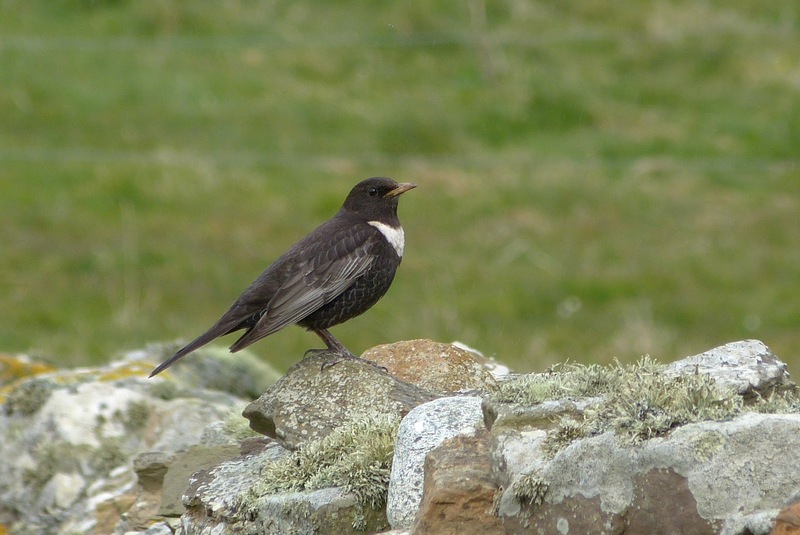 Some of the Ring Ouzels found their way to Holland House in the afternoon, and this first-winter male was caught and ringed. The best arrival of migrants of the year so far occurred on a far nicer and far calmer day. The highlights were the first 3 Lapland Buntings and 7 Willow Warblers of the year, while other species were present in increased number. These included 66 Wheatears, 11 Robins, 2 Swallows (the first since the very early migrant on 27th March), 5 Chiffchaffs, 12 Redwings, 8 Song Thrushes, 7 Fieldfares and 280 Meadow Pipits. A Redpoll, a Siskin and 3 Bramblings were all new finches, and a Goldcrest and a Carrion Crow were also freshly arrived. A Long-eared Owl, a Hen Harrier, 3 Sparrowhawks and 2 Merlins were seen, and at least one new Woodpigeon arrived in addition to the lingering 2. 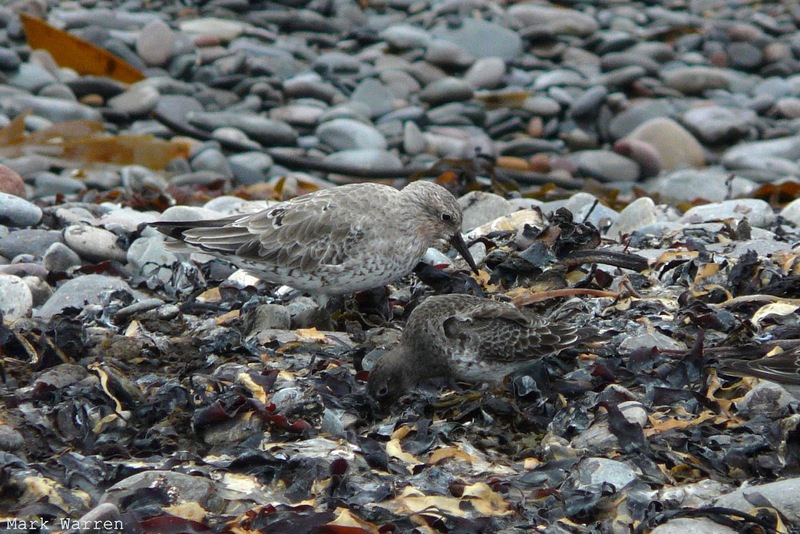 Easterly gales and rain are often the ideal conditions to produce a fall of migrants on North Ronaldsay, although they are far from the ideal conditions for actually finding whatever birds are present and sheltering from the elements. On this particularly blustery and wet occasion, only a small number of new birds had arrived, the most notable of which were the year's first Tree Pipit and Blackcap. A Dunnock, 4 Robins, 13 Wheatears, 4 Chiffchaffs, a Goldcrest, a Chaffinch and a Brambling made up the rest of the passerine migrants; 2 Sparrowhawks, a Merlin and a Peregrine were the day's raptors. An abrupt overnight cessation of the cold polar winds brought a pleasant and sunny day, as well as, more importantly, a few new migrants. 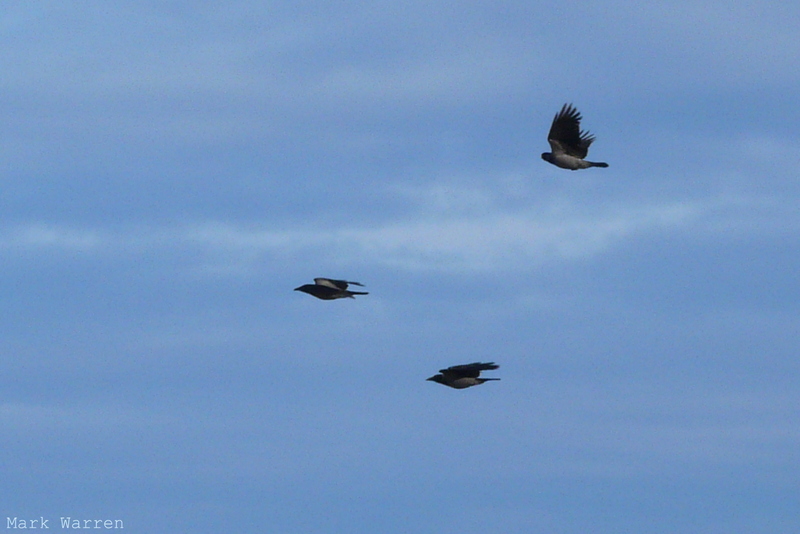 Corvids were on the move in the morning, with 21 migrant Hooded Crows, 5 Carrion Crows, 5 Rooks and a Carrion x Hooded Crow hybrid flying south; although several of these had a change of heart and were seen flying back north a short time later. 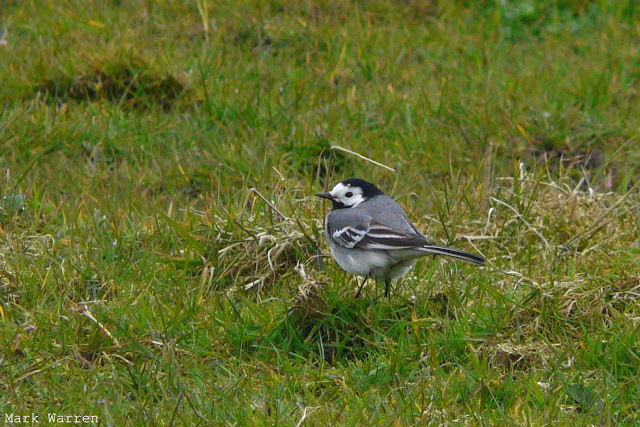 The year-list increased by an Arctic Skua, and the year's first White Wagtail was found outside the observatory. Counts of other migrants came to 10 Wheatears, 4 Robins, 4 Chiffchaffs (only 2 of which were new), 1 Siskin, 3 Sparrowhawks and 48 travelling Curlews heading north overhead. Still cold, northerly wind and frequent stinging hail showers kept the migrants away, and a Grey Plover was just about the only new bird. Both Woodpigeons and 4 White-fronted Geese were still around. Several hundred Golden Plovers have been seen most days recently, and many are now in fresh breeding plumage. At a top migrant hotspot like North Ronaldsay, every year brings exciting periods of the constant and varied bird movement that make it such a fantastic birding site, interspersed with occasional periods of unfavourable winds and almost no noteworthy bird passage whatsoever. This little spell fell squarely into the latter category. Cold northerly winds throughout brought little besides a Sparrowhawk on the 13th and a Grey Plover on the 14th; although small numbers of Robins and Wheatears each day might have included the odd new migrant. A Manx Shearwater on the 14th was at least a new species for the year, flying past the seawatching hide on a date slightly earlier than average for the species. Up to 3 European White-fronted Geese and 2 Iceland Gulls continued their protracted stays, and the 2 Woodpigeons were still around to the 14th. Noticeably fewer migrants included 6 Robins, 6 Wheatears, a Song Thrush and a Chiffchaff, most of which appeared to be newly arrived. An Iceland Gull and the Collared Dove remained from earlier days. 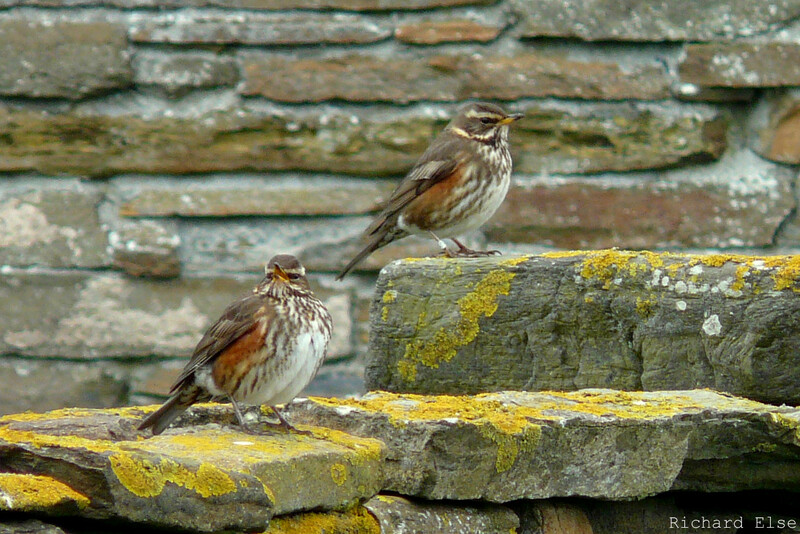 A few Redwings are being seen most days, although many of them still seem to be the wintering birds. It was expected that overnight easterly wind and rain would ground a few birds, and a light sprinkling of fresh migrants was indeed evident in the day. 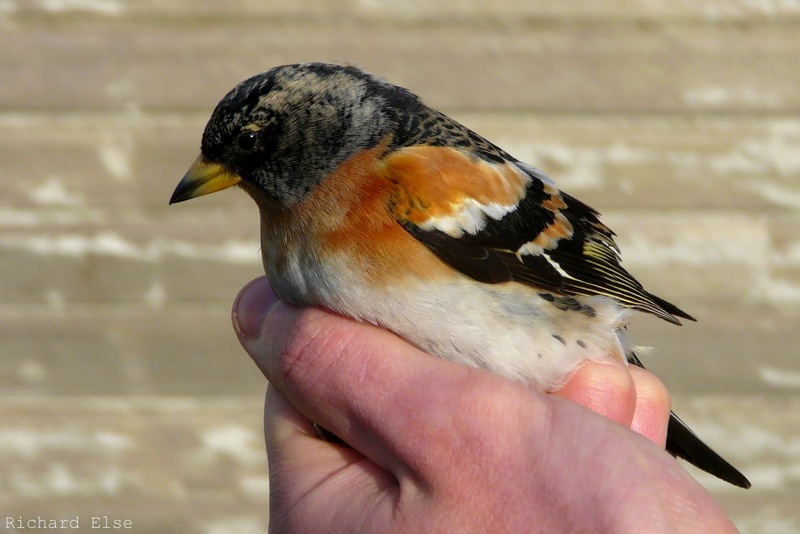 Robins and Wheatears were the most numerous new passerines, with 13 and 17 respectively, while other odds and ends included a Brambling (the first of the year), a Chaffinch, a Fieldfare, 2 Song Thrushes, 2 Chiffchaffs and 2 Rooks. A couple of Woodpigeons appeared to be new birds arriving from the sea, and a Water Rail at Holland House had also probably just arrived. The Collared Dove, Greenfinch and 2 Iceland Gulls were all still present. With the wind starting to back to the south-east and intermittent light showers, a small number of birds eventually began to arrive. A trio of finches freshly arrived in Holland House gardens comprised a Goldfinch and a Greenfinch, which were both new species for the year, and a Siskin; a couple of Chiffchaffs and a Goldcrest were found; and new migrant raptors included 2 Sparrowhawks, a Kestrel and a Peregrine. The Collared Dove was still around, and 2 Woodpigeons were seen in the evening. Both the Glaucous Gull and an Iceland Gull were ﻿still present. 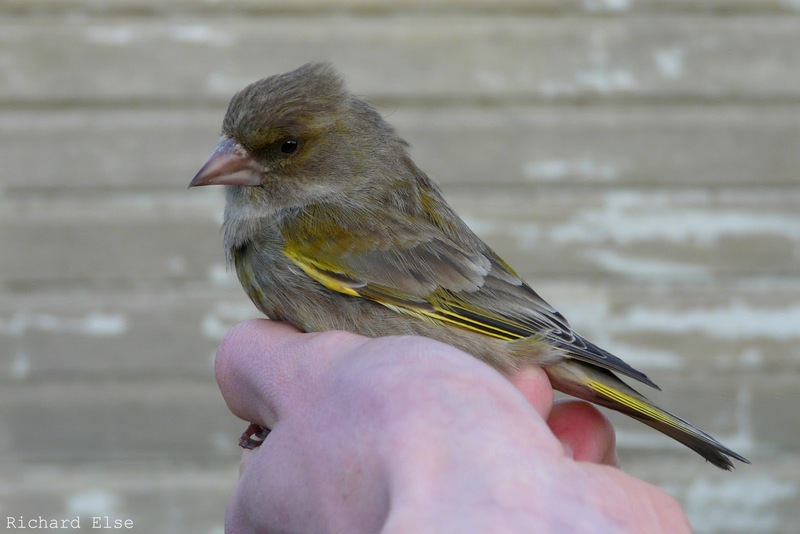 Both Greenfinches and Goldfinches are scarce migrants on North Ronaldsay, despite the former species being quite common on Mainland Orkney. The first Collared Dove of the year was the best migrant of another quiet and mostly wet day. Other sightings included a Woodpigeon, a Woodcock and 142 Meadow Pipits - the highest count of the year so far. A Glaucous Gull and the usual Iceland Gull duo were among good numbers of the common gulls, including Common Gulls, and the Hen Harrier was still present. 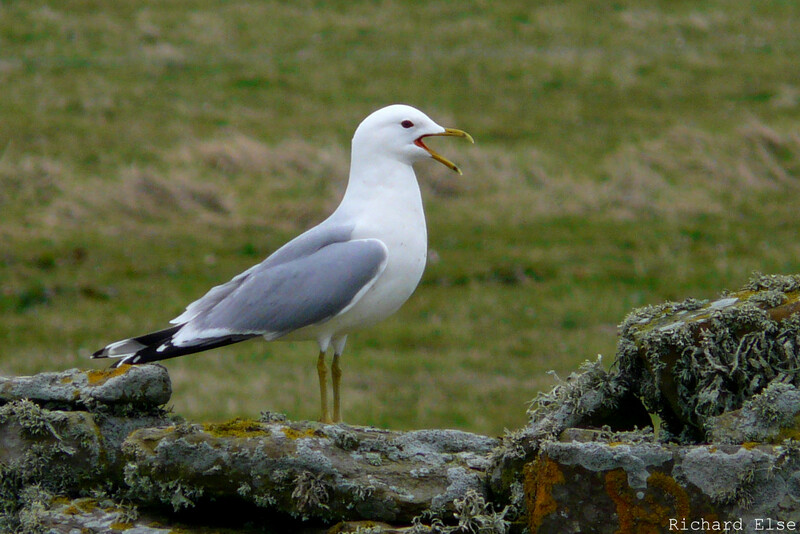 Plenty of Common Gulls are now back in the colonies in the north of the island. Gull flocks elsewhere on the island included over 100 Herring Gulls and 6 Lesser Black-backed Gulls, as well as increasing numbers of Black-headed Gulls returning to their nesting sites. The year's first Orcas were the cause of some excited dashing around the island in the afternoon, although the pod of at least 6 animals could not be relocated after the intitial sighting. There was still little change in the migrant birds, but a flock of 10 Snow Buntings flew over the island in the morning, a Hen Harrier and a Sparrowhawk were both new and 3 Merlins were seen. 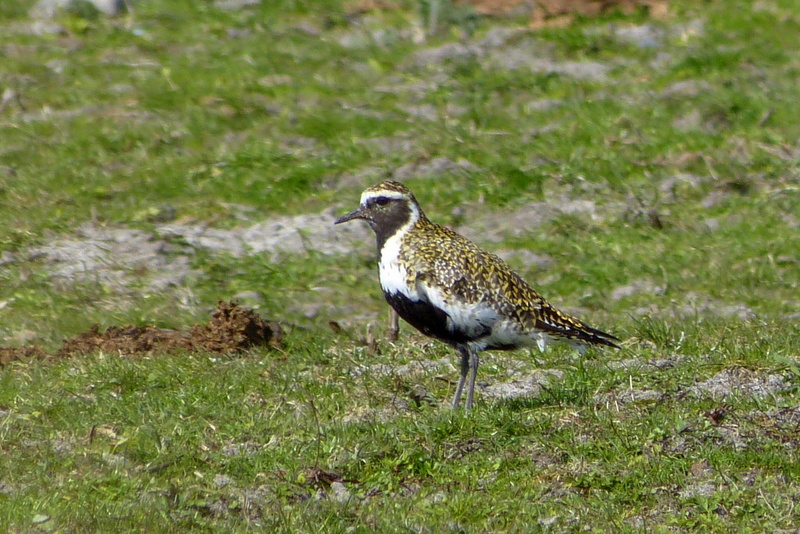 A Grey Plover was also new, and the number of Golden Plovers reached more than 400 birds. The spring migrant unions remained defiantly on strike, the birds still stubbornly refusing to show up. The only determined knobsticks to dare cross the picket lines of migration were a single Woodpigeon, 9 Black-tailed Godwits and an Iceland Gull. The godwits, at least, were an addition to the island year-list. Although there was still little indication of spring migration resuming at any real pace, census counts of 1 Sparrowhawk, 1 Dunnock, 5 Wheatears, 4 Chiffchaffs, 2 Goldcrests and 4 Rooks were a noticeable improvement on recent days. 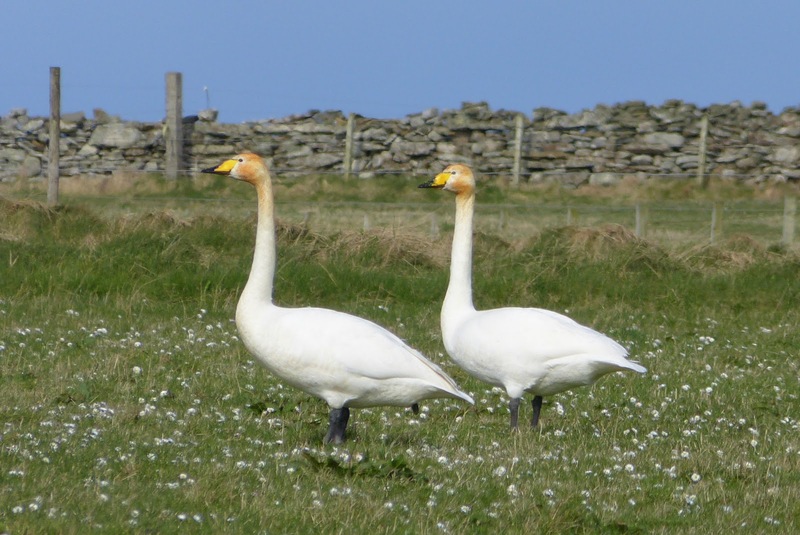 The four wintering Whooper Swans are still present, and have become increasingly orange-headed during their stay. The discolouration is caused by the chemical composition of the water they feed in, which may include staining iron and tannins. The dearth of migrants continued, with mainly just the same long-stayers featuring again and again in a Groundhog Day of birding. Up to 9 White-fronted Geese and both usual Iceland Gulls remained, along with the Grey Plover, the Rook and a Goldcrest. 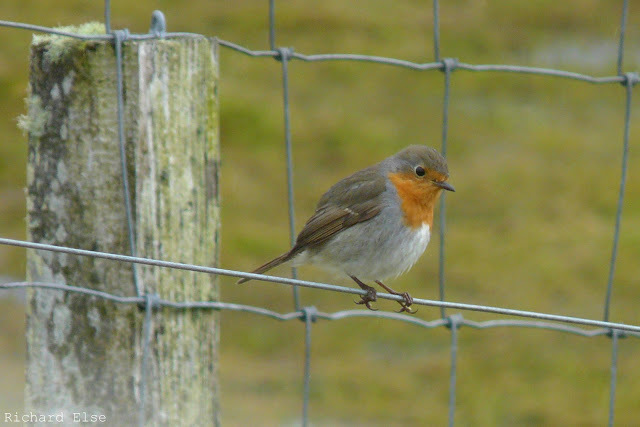 A Robin was the highlight of the 3rd; a Peregrine and 22 high northbound Curlews were the best sightings of the 4th. A return to winter conditions, complete with frequent flurries of snow, did little to increase migrant numbers. The first Great Skua of the year flew by at sea, 2 Grey Herons arrived and a Rook was seen, but most other birds were hanging on from earlier days. Presumably the same Jack Snipe was flushed from the usual spot in Kirbest Mire, 14 European White-fronted Geese were still around, and passerines still included 115 Meadow Pipits, 3 Wheatears, 2 Chiffchaffs and a Goldcrest. An inauspiciously birdless and chilly start to April brought no discernible signs of migration at all. The Grey Plover, both the usual Iceland Gulls and a couple of Wheatears were the best of the lingering birds, although good numbers of the common wildfowl and waders were still around. 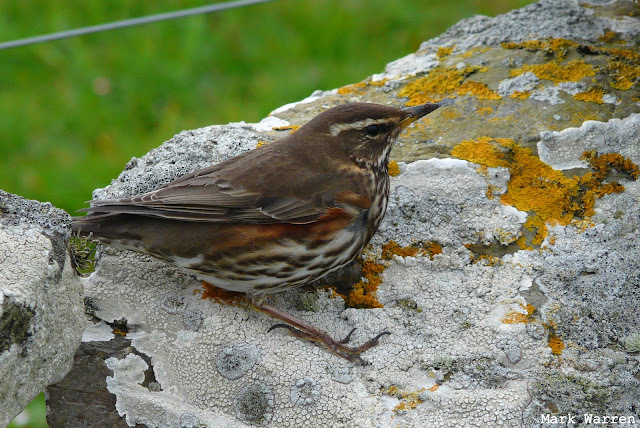 A few small groups of Redwings are still dotted around the island. Those that have been caught for ringing have included both iliacus birds from the European mainland and some of the larger, darker Icelandic breeding subspecies coburni. The highlight by far of a distinctly cold day was a Black-throated Diver in full summer plumage flying past the old beacon. A couple of Chiffchaffs and a Rook were the only new land migrants worth mentioning.